Busy “living the London life”? It can be easy to forget that you are actually surrounded by beautiful places in the city. During the summer there are a number of different beautiful places you can visit in London like Kew Gardens and Primrose Hill. But what about during the winter? Where can you find beauty in the city when it’s minus 15 and even your snot is freezing? Fortunately, London really does have a lot of places that are beautiful INDOORS, where you can also get a decent coffee. So I told you in my previous post about the best Indian restaurants in London, that I am starting to really warm towards round-up posts. The reason is because I can give you the low-down on places like Sketch. You may see Sketch feature so heavily in Made in Chelsea and believe that you won’t be able to afford to go there, but trust me, you probably can. One of the main appeals of Sketch is that it has five rooms that cater to all tastes, budgets, and moods. As well as being one of the more well-known spots it Mayfair, it also has one of the most varied food and drinks menus. The Glade Room (pictured above) is designed to look like an outdoor sanctuary, complete with fluffy carpet that looks like grass. Not only can you sit in relaxing, tranquil surroundings and order from a super varied menu. In fact, the Glade Room at Sketch shares it’s menu and sitting times with the Parlour. Aside from the awesome food available, there is a novelty that pleasantly surprises anyone visiting, which is a self-playing piano! For more information about the Glade Room at Sketch, Secret London have a great article. The Parlour is pretty much “the bar” and walk-ins are welcome. This is the best guide for people who want to dip their toes into Sketch without actually paying out lots of money to get food or afternoon tea is to just walk-in to the Parlour and have a drink. This room is the most “night out-y” and they often have live music acts. They also have creative nights which is, I guess, where the ‘Sketch” part comes in. The Lecture room is the main restaurant room at Sketch and has not one Michelin Star, but two! Delights available on the menu include Guinea fowl with gingerbread butter and Scottish Highlands Venison. The plush red room has a subtle, warm ambiance which would appear welcoming to anyone. The East Bar and Pods is one of the main bar areas in Sketch. Open in the afternoons/evenings of weekdays and weekends, they play music and serve some great cocktails. The East Bar and Pods are like 60s futuristic chic and have a very “Clockwork Orange” feel about them. The Elan Cafe in London is a constant source of pretty pictures on my Instagram feed. To be perfectly honest if you are not going for the Gram, you might as well get one of these and stay at home. One of the main appeals of Elan Cafe and it’s floral paradise is that it is bright, spacious and airy. Being situated in the middle of Mayfair, you would think that would be hard to accomplish. The fact that their delicious cakes always match the colour theme of the cafe itself is probably one of the most unique selling points I have heard in a long time. As if the standard cakes like the Millionaire Shortbread and the Popcorn Blondie cake were not to die for – they also have a beautiful selection of tarts. Not only is Elan one of the prettiest cafes in London, it’s one of the tastiest too! The Palm Vaults in Hackney has a distinctively 80s/retro feel and a giant plastic flamingo really wouldn’t be seen out of place here. Their brightly coloured lattes that match the “Miami Vice” theme have caused quite a stir on Instagram. I’ve always thought there is something oddly comforting about eating and drinking surrounding by lush foliage, and you could be forgiven for thinking you are somewhere else in the world while you enjoy your Matcha. They also have a ton of veggie and vegan options and red lattes made with beetroot. Incredible! Aida is not just a cafe. Marketing themselves as more of a “hangout”, Aida cafe in Shoreditch is also a multi-concept store with a “flea market” kind of feel. But if you don’t visit to shop – visit for the floor to ceiling windows and the vibrant lattes. You’ll find a lot more than just a Chai latte here with flavours extending to Turmeric, Matcha, and Rose. They also offer free wifi and a selection of home baked treats. Farm Girl cafe in Notting Hill isn’t just a beautiful place to spend a couple of hours if you are bored. The co-founder Rose grew up an Australian dairy farm and she is into using fresh and nutritious ingredients in a BIG way. 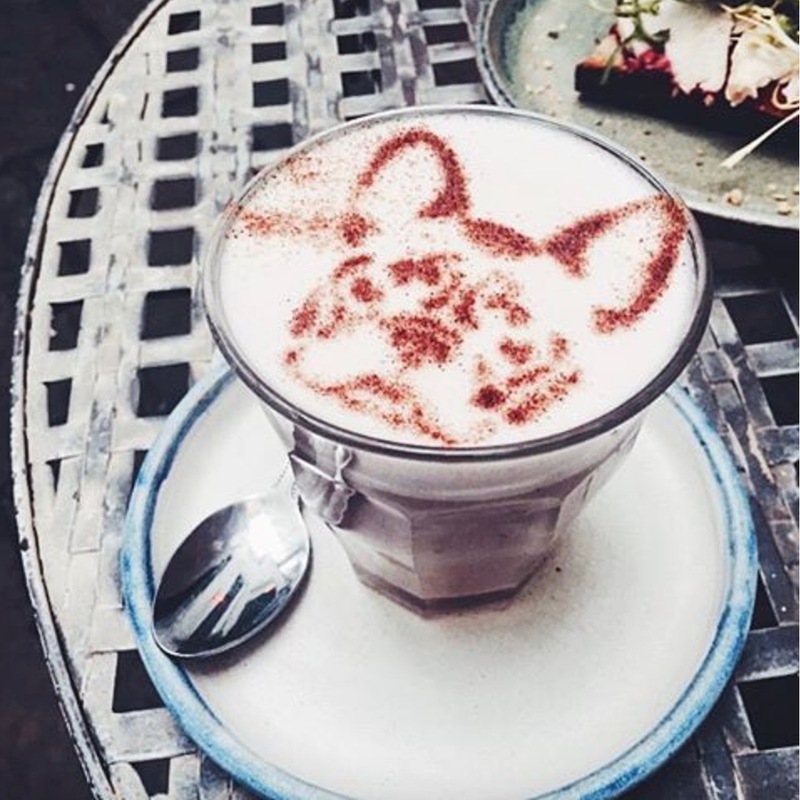 You’ve probably seen their latte art on Instagram and they are particularly famous for their French Bulldog latte stencil. Because they know how Instagrammable they have become, they even take care to make their lighting “iPhone friendly”. Oh and if that wasn’t good enough for you, they are dog-friendly. *None of the cafes in this roundup have paid for or sponsored any content on this page. I have added all of these to my London to do list for this year, Sketch looks incredible!